Elegant, dark, evil - AND LIMITED: Black Edition - only 500 units! The next generation of legendary Waldorf analog modeling technology as been enhanced in many areas, providing even more authentic emulation of the underlying analog circuits. Marvelous solid aluminum controls, which form a clear user interface on a stylish desktop housing, are true eye-catchers next to the sleek display and remind you of the cutting-edge design of the new Korg Synthesizers! Here you have all the most essential parameters directly at your finger tips! The lush Paperwhite display is also used for targeted navigation through sounds and settings. 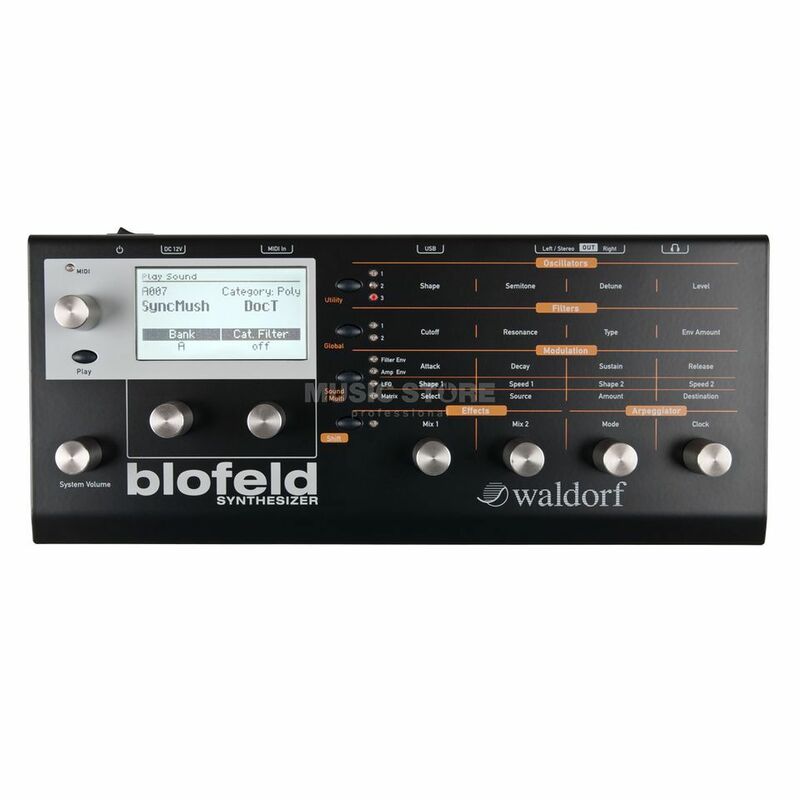 Equipped with 1000 fully editable Waldorf sounds, the Blofeld can be connected via USB 2.0 to a Mac or PC for clear editing and management of its sounds. 2) Quite impressive sound if you tweak it right. I have to say that factory presets are terrible and dated. 3) In a real life 4 knob matrix is rather comfortable,. 1) Bouncing or unresponsive encoders could be really annoying if youre unlucky enough. Encoders can be fixed if you are familiar with screwdriver and soldering iron, but it is a biggest possible problem of this synth. 2) Useless built in overdrive. Even cheap guitar pedal sounds better. Overall impression - really good synth for a money. After a few hours of tweaking youll love it. Por el precio que tiene puede ser de los sintetizadores más completos del mercado. Puede hacer prácticamente de todo, desde sonidos V.A pasando por F.M y el potente sistema de WaveTables. Pocos controles físicos pero la matriz y los editores hacen la programación muy facil y rápida. Si te gusta el sonido Waldorf, es un buen sinte a tener en cuenta.